The Morning Mindset, Habits, and Routines That Have Made Me Rich! A Free booklet by New York Times Bestselling Author Lewis Howes. Get your free Millionaire Morning booklet shipped to you, plus instant access to all of these bonuses - a $250 value and just pay shipping! We’ll ship you as many booklets as you want (just pay shipping for each one)! 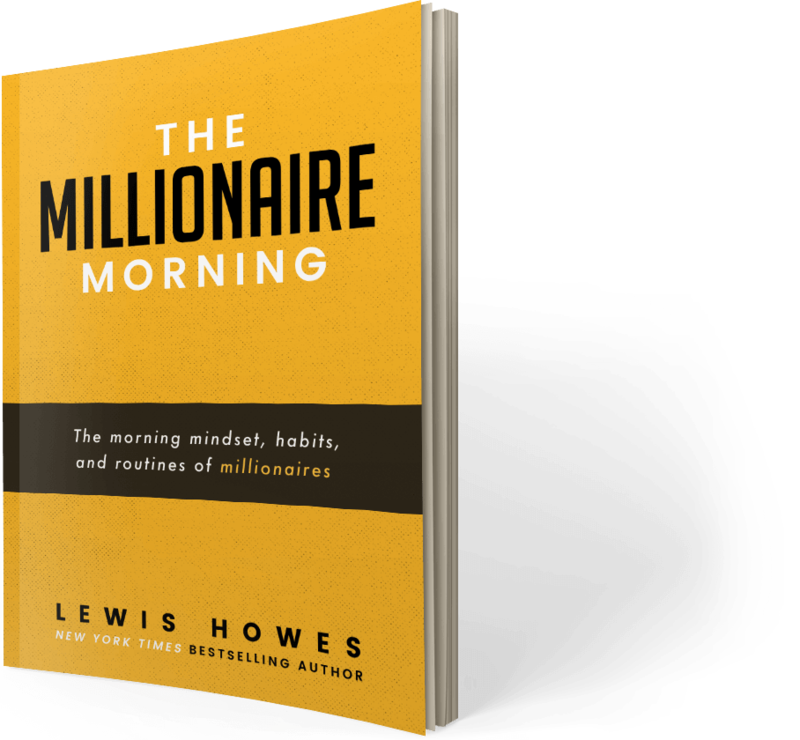 The Millionaire Morning is a simple guide to understanding the top rituals, routines, and habits that I’ve learned from interviewing some of the most successful millionaires, and applied to my own morning routine. But few talk about how to set up your morning to create financial freedom! The information out there mostly talks about different things you should be doing in the morning to have an optimal life or for your health. Otherwise you get into the habit of going through emails and doing other things that make you distracted from actually generating more income. If you’re a freelancer, entrepreneur, or anyone trying to make money on the side, making money needs to be one of the first thing you think about in the morning. Health is #1 because all of the money in the world doesn’t matter if you are too sick to enjoy life. Mindset is #2 because this is what frees us from the stress, overwhelm, pain and challenges we face in daily life. If our mind is weak or broken and we don’t know how to free ourselves then we will always feel like we are stuck in life. This is also a key factor in what separates wealthy from broke (more on this in The Millionaire Morning). Many decisions we make are based off of how much money we have (or what we lack). And money can be the cause of so much stress, anxiety, and challenges. It’s something that I’ve always struggled with my entire life until I learned these key principles in The Millionaire Morning and flipped the money switch on. If you grew up like me, no one talked about money in a good way, and it was always a stress feeling like we didn’t have enough. It was tough on my parents and their relationship, it was tough on us kids, and it was something I was determined to figure out when I could. In 2007, I was broke, living on my sister’s couch, and I had no idea how to make any money. I knew life wasn’t working and I needed to figure out how to make it work… so I started to study the rich to learn how they think, and from hundreds of interviews with multi-millionaires and billionaires on the School of Greatness Podcast, I’ve learned that you’re not making money unless you’re actively working on these key principles. The reality is, if a broke kid with no money living on his sister's couch from a small town in Ohio can do it… so can you! But if you’re only maintaining, working on low priority tasks, and servicing clients instead of thinking: “how can I make more money?”, it’s not going to magically happen. How am I going to generate more sales? How am I going to create more partnerships? How am I going to get my money to work for me? This booklet is filled with simple teachings that anyone can apply! They are powerful exercises, examples, and morning routines from millionaires I’ve interviewed - and it’s something anyone can do no matter where you live, or how much or little you make. I break down step by step how you can overcome the financial challenges you face and get started making the money you desire. This booklet is absolutely free. It is my gift to you. All you need to do is cover the $7.99 for shipping and handling. There is not a catch, no fine print, no clause you are missing. It is 100% free from me to you, and I can tell you there is no profit in this for me outside of the satisfaction that I know I am giving my all to my own dream, which is helping people. So what’s in it for me? Why would I do this? Because I want you to be living YOUR best life. You deserve all the wealth and happiness in the world. But YOU have to activate this calling; no one is going to turn it on or you! I know there are times that are challenging, and it may seem like you can’t get out of it. I’m living proof that you can. If a small town boy from Ohio (who didn’t see any potential for his future) can do it, then so can you! Your dreams matter because YOU Matter! Never forget that, but you must learn the wisdom, skills and tools to write your own story. Be the hero you were born to be. Start the journey with me because the world needs you my friend! It’s Time To Take Massive Action. We are only printing a small amount of copies of this booklet, and then we will be charging full price for it. We have never done anything like this before and it feels like a risk but again, you are worth it to me! I am committed to your growth and freedom so I have decided to take my giving to the next level. For these reasons, I don’t know how long this offer will be available so take advantage today. My guarantee to you is that these habits, when implemented, will make a difference in your life. I know when you take action, you’ll get results. These are the same principles I have followed day in and day out for the last 10 years that have enabled me to contribute to my community, my family, and to the world on a much larger scale than if I was struggling to make ends meet. Click the button below to get your FREE copy now. You’ll be glad you did. Before LEWIS HOWES became a media sensation for empowering people and sharing 'Greatness' across the globe, he had his share of obstacles to overcome. From childhood sexual trauma, to having a learning disability, which led to being alone and bullied in school, to being injured and broke on his sister’s couch, Lewis’s story is the perfect example of how anybody can overcome the obstacles in their life and achieve greatness. Fast forward a few short years, and Lewis is a New York Times Bestselling author of the hit book, The School of Greatness. He is a lifestyle entrepreneur, high performance business coach and keynote speaker. A former professional football player and two-sport All-American, he is a current USA Men’s National Handball Team athlete. He hosts a top 100 podcast in the world, The School of Greatness, which has over 30 million downloads since it launched in 2013. He was recognized by The White House and President Obama as one of the top 100 entrepreneurs in the country under 30. EARNINGS DISCLAIMER. RESULTS NOT GUARANTEED. Any statement made on this page regarding income or earnings are provided as personal examples only, and do not guarantee you future earnings or income. Please note that my results are not typical and that I am in no way guaranteeing that you will achieve the same or similar results. As with any endeavor, results may vary, and depend on a wide variety of factors including, but not limited to, your skill, knowledge, ability, dedication, business savvy, network, and financial situation. The use of any products or services offered through 418 Media, LLC should be based on your own due diligence. You agree that we at 418 Media, LLC, (including sponsors, promoters, advertisers or affiliates), are not responsible for the success or failures you experience in your personal or business life.